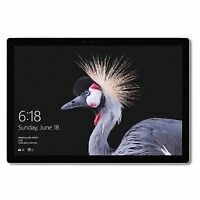 Microsoft Surface Pro 6 12.3" Tablet Intel Core i5 8250U 128GB SSD 8GB Warranty! Condition is Used. -OEM Keyboard. 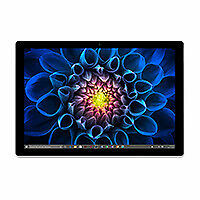 New ListingMicrosoft Surface Pro 6 12.3" Tablet Intel Core i5 8250U 128GB SSD 8GB Warranty! Stylus and Keyboard not included. Used in good Condition. This item has been used previously. Just replaced under warranty Microsoft Surface Pro 5. It is mint condition. Will come with a fingerprint type cover. The type cover got a little glue on the bottom of it but works perfectly. Will come with oem charger. 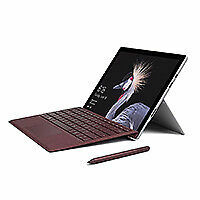 Microsoft Surface Pro 5th Gen Intel Core i5, 8GB RAM, 128GB Type Cover. Condition is Used. Shipped with USPS Priority Mail. 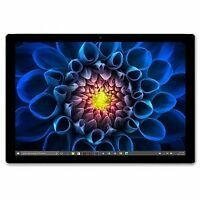 Surface Pro 128GB Black This is a multiple quantity listing, all surface pro's are in very similar condition to the item pictured. Bundled with charger, and keyboard shown in picture. Surface Pro is in overall good overall condition with some wear and scratches. Please see all pictures before purchase. Everything works great! All buttons functions and features work just as they should. Convince your employer to recycle their electronics with PCs for People. Clean out that closet full of old electronics and drop them off at our office. Our mission is to create new opportunities by providing affordable personal computers, computer repairs, and internet service to people with limited technological experience due to social, physical, or economic circumstances. This tablet comes with keyboard and aftermarket charger. IMPORTANT: Sometimes when the keyboard is connected, the mouse will stop working or keys won't work. Sometimes it'll make the tablet restart when moved. It seems to work best on a flat surface. It's not a Microsoft keyboard, it's aftermarket, so that could be the issue, but I'm not sure because I haven't tried using a Microsoft keyboard with it. The tablet by itself works great! No issues, super fast. The screen is in great condition. No scratches or chips. See pictures. I've reset the device to factory settings. 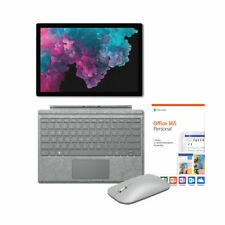 Microsoft Surface Go 128GB Hard Drive with 8GB of Ram, Wi-Fi - Silver. Microsoft Surface Pro (5th Gen). Equipped with LTE cellular connection. 256GB solid-state drive. Core i5 Processor. Original box and charging cable also included. Capacity: 128GB SSD. Model: 1796. Manufacturer: Microsoft. Ports: 1 x USB 3.0, 1 x Mini DisplayPort, 1 x Surface Connect Port, 1 x 3.5mm Headphone Jack, Dual Microphones, 1.6W Stereo Speakers. 431 N Wright Brothers Drive. Condition is Used. This is a late model 2017 Surface Pro with the fanless i5 CPU. It is wiped and ready to go. 256GB Microsoft Surface Pro 1514with Win 10 Pro, i5-3317 @1.7Ghz, 4GB RAM. The unit has been upgraded to Windows 10 and is in full working order. Windows has been reset so will need to be setup upon receiving the tablet. Touch works everywhere on the screen. This surface is in good condition overall. It has a cracked screen. You will receive the Surface tablet only. This tablet worked without issue prior to being reset and I have used MS Paint to 'swipe' the entire screen in addition to using every key on the keyboard without any problems. All of this said, while I have every reason to believe this is a fully functional tablet, it is older as well as having been used and I am unable to fully test every feature so everything is being sold AS-IS. Our mission is to create new opportunities by providing affordable personal computers, computer repairs, and internet service to people with limited technological experience due to social, physical, or economic circumstances. We will be happy to help. We are not professional appraisers or experts on each item or category of item. Microsoft Surface Pro. A Platinum Premium Leather Protective Case with Kick-Stand and keyboard holster. The touch works everywhere on the screen. This surface has a broken screen. The LCD is fine. SSD: 128GB. Make: Microsoft. Model: Surface Pro. It may show light wear from normal use. NO POWER CORD IS INCLUDED. Elkridge, MD. How long will it take to receive my item?. 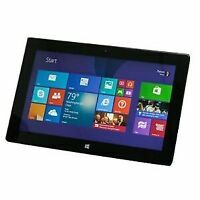 Microsoft Surface PRO i5-3317U 128GB 4GB RAM 1.70GHz Wi-Fi Windows 10 Pro 10.6" Tablet. No keyboard, no stylus pen or other accessories are included. This is a Surface Pro 1 in very good working condition, screen has minor wear and back has normal wear. Refurbished Tablet in Good condition. All photos are of our worst conditioned item in a lot. You will likely receive an item of equal or better quality than the actual photos. Screen is in great condition. Body has light scratches on the back and around the charging port. This Surface Pro is fully functional and in excellent working condition. There is noticeable wear on the body from normal use, as shown in pictures. Stylus NOT included. If you would write ‘Recycle” on the outside of the box and send it back we will make sure your item gets processed through the proper local downstream when it arrives! 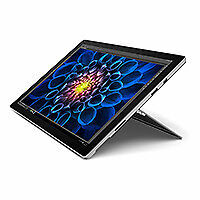 Microsoft Surface Pro 128GB, 5th generation, Wi-Fi - Silver. Condition is Used. Comes with platinum Surface Keyboard. Intel i5 processor, 8GB RAM. No scratches, dents, or dead pixels. Like new, comes with power supply and in original box. Shipped with USPS Priority Mail. 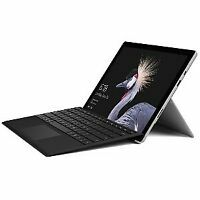 Microsoft Surface Pro 5 1796 128GB, 4GB, i5-7300 2.6GHz - USED. Condition is Used. Shipped with USPS Priority Mail. The touch screen and type cover do not work with the surface. The type-cover works via blue tooth but not via hard direct connexion. Model: Surface Pro 5 (2017). Screen Size: 12.3". Color: Silver. This unit has been thoroughly inspected and tested by our in-house, factory certified-trained technicians. Flawless Condition - The device is in pristine condition, perfectly functional on every level of use. Great device that was well taken care. Only show of use will be the keyboard for obvious reasons. Getting rid of it because I have a new computer from work and never use it. In addition to the touchscreen, the Microsoft surface can also be hooked up to a keyboard for added typing convenience. Make: Microsoft. 10.6" Screen Size. 1921 x 1080 Screen Resolution. Q: Are Your Prices Negotiable?. The versatility of a laptop and tablet. Surface Pro 4 handles tough tasks while being lighter than ever at 1.73 pounds. The 12.3-inch PixelSense™ display has high contrast and low glare. Go from laptop to tablet with the Kickstand and keyboard, and jot notes with Surface Pen. The 6th Gen Intel Core m3, i5, and i7 processors inside Surface Pro 4 are more powerful, quieter, run cooler, and are more efficient than before. It also features 9 hour battery life, and 5 MP front-facing and 8 MP autofocus rear-facing cameras. Runs Windows and Office perfectly. Surface Pro 4 runs Windows 10 Pro, as well as all your professional-grade software with no compromises, including. Microsoft Office. Write directly on webpages with Surface Pen in the Microsoft Edge browser and share your notes easily. Writing with Surface Pen feels like using a ballpoint pen on paper. Use Pen to open a OneNote or to activate Cortana, your digital assistant. With Windows Hello, Surface Pro 4 knows you’re you, and will sign you in with no password required. eBay has provided more information about this product above and is not affiliated with or endorsed by Microsoft. *The average sold price is calculated based on "Buy It Now" items sold within the 90 day period described above (excluding shipping and handling). Each interval represents a 15 day period. There is no guarantee that items will always be listed at a price within the provided range. I'm an IT professional and wanted something portable that I could use for a tablet or for heavier tasks. The battery isn't great but it handles the two things I wanted remarkably well. High Quality, graphics are great, searching internet is really fast, I have a Razer laptop and this faster and works great for my company. Wish it had a SIM card slot but I won’t knock off for that because of how fast this little machine works. I have been looking for something small to take my business on the go and to always be connected. My tablet (open box) arrived in flawless condition, perfectly brand new. Works flawlessly, drawing and writing on it is a blast! (still gotta buy the pen and keypad though). The screen quality is AMAZING, and it's quite powerful even by full-fledged laptop standards! These Surface Pro tablets are great, though they get a lousy rep for low battery life and high heat. Yes, it gets hot when you ramp up the CPU, like with games and malware scanning, etc. Yes, it supposedly has a 3hr battery life. I say supposedly because I've really haven't gone outside the house with it yet., , This 1st gen tablet is still very impressive and sell for great prices now, and yes, the i5 can play Crysis just fine on medium settings. I use Photoshop, Lightroom, and Illustrator without issue/lag on here, upgraded it to Win10. The 4gb of RAM is just OK. You have to use it wisely. Chrome eats up RAM so you may want to switch to Firefox to save space. I highly suggest staying away from the 64gb version, because after Windows is installed, you only have like 30gb to play with., , The single USB 3.0 slot on the left side does its job very well. I can import photos and such very quickly into Lightroom with this. I highly suggest getting a case that has a kickstand ability so you aren't stuck with the single-angle integrated kickstand. The 1080p 16:9 screen is good, although Microsoft realized that it does feel a bit cramped vertically, so they revised it on the Surface 3 with a 2.5k 4:3 ratio version., , I highly recommend these for full windows and price alone, I think it's a great deal. The mobility is great. 1st Gen Surface Pro i5 worked amazingly well. I am an it specialist and I am very impressed with the performance of the i5 Surface Pro 1st Gen. There is no lag, it starts quickly and performs better than I expected. The Microsoft Surface Pro tablet is designed to combine the portability and convenience of a tablet with the power of a laptop computer. It is lightweight and has a long-lasting battery, so it can be used for work and entertainment on the go, meaning you can keep your kids entertained on long car trips without worry. The Surface tablet runs on the Windows 10 operating system and is compatible with the Microsoft Office software suite. 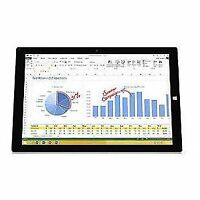 What versions of the Microsoft Surface Pro tablet are available? What type of screen does the Microsoft Surface Pro have? The Pixel Sense display, which measures a generous 12.3 inches, functions as a 10-point touchscreen and is also compatible with the Surface Pen. The Surface screen has HD resolution of 2736 by 1824 pixels and a 3:2 aspect ratio suitable for both spreadsheets and streaming video. This touchscreen can also be augmented with the Surface Pro keyboard and mouse to be converted to a full laptop. What are video and audio features of the Surface Pro? This tablet includes front-facing Dolby Audio Premium 1.6-watt speakers and two microphones. It is equipped with an authentication camera as well as both a 5.0MP front-facing camera and 8.0MP rear-facing autofocus camera. Both support 1080p Full HD video that can be used for Skype calls. What ports and connections does the Surface Pro support? This tablet has USB 3.0 support and a microSDXC card reader as well as a 3.5mm headphone jack. You can connect to the internet using 802.11ac Wi-Fi wireless networking. This tablet is also compatible with Bluetooth connectivity so you can use wireless keyboards, headphones, and devices. What is the Intel Core processor? This processor is designed to support crisp streaming video with 4K graphics. The m3 model is designed to combine lightweight utility with speed and power. If you upgrade to the i5, you will be able to create, edit, and share video and other multimedia content. The i7 supports seamless gaming and 360 video as well as Thunderbolt streaming technology.